Here is a great little video from John Huntington demonstrating how sound takes time to travel through the air. At our work day one week ago, a team of folks cleaned up and organized the Events Center backstage area. Our hope and expectation is that from now on the Events Center will return to this state after each and every event. While this doesn't necessarily require a video, we wanted to let you see that neatness is indeed possible with the hope that it will inspire you to keep it that way. Thanks in advance for your help in keeping this area in order. Events Center Backstage Organization from David Wilcox on Vimeo. One Sunday down. Fifty-one to go. I can't believe it's already 2009. What happened on this first Sunday of the new year? Judah Groveman and Zelos led us in singing. Mark Mitchell prayed for a missions team to India and shared other pastoral priorities, aka announcements. 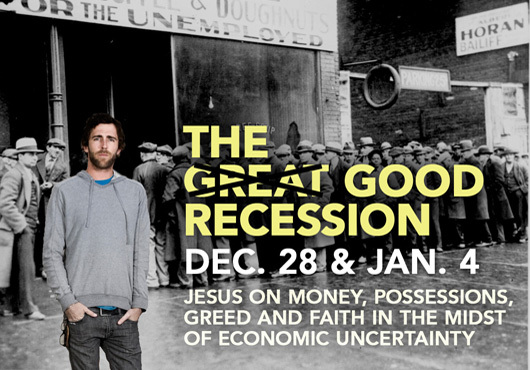 Josh Harris preached the second and final sermon in the short series, The Good Recession. If you missed it, please listen and ask God to adjust your thinking about need, greed, and money. January Meetings - Don't forget the first round of mandatory meetings this weekend. Come January 10th at 9:00a if you are on the sound, lighting, or IMAG video teams. January 11th at 1:30p is the sermon audio team meeting. Stay tuned for final locations, which are dependent on final RSVPs. If you opt not to attend this weekend, you must attend the second round on January 18th and January 24th. Awareness Around Equipment - We experienced a surprising glitch this Sunday. In the third song of the second service, the lyrics froze. But they only froze in a few places: the mezzanine televisions, the confidence monitors, and the RF feed. The lyrics computers themselves were working fine, and so was the main screen. After a bit of somewhat frantic troubleshooting, we located the problem. The center screen scan converter "freeze" button was on. To be completely honest, I am not sure exactly how it happened. Given it's location, I would not be surprised if an accidental and very light kick from a toe happened to turn that button on. Obviously, it was no one's fault except my own, and we'll protect that gear with some plastic covers as soon as possible. This is a great opportunity to remind everyone to be aware of the equipment around you. Beware of Bibles on keyboards or lighting boards, involuntarily toe-tapping the camera tripods, stretching your legs out under an equipment desk, brushing the audio patch cable bay as you walk by, loose sleeve wristbands catching sound board faders, and the list goes on. These are all things we've experienced, and, though accidental, they can still easily distract. Saturday rehearsal this weekend went well. The band wrapped up 15 minutes early, which is always a good sign. Gavin admitted, though, that the rehearsal didn't start off so well. The monitor team hadn't fully checked outputs before stopping to eat dinner, so there was some troubleshooting going on during the first twenty minutes of rehearsal. That definitely slowed down the official rehearsal start time, but the band was still able to get through all their songs in the designated time. Audio producers, please always make sure to do all line checks before eating dinner. The mix was very good this weekend. Dave, I thought the sub frequencies this weekend were spot on. You are really helping us get this right, and I'm grateful for your hard work. The overall band sound definitely benefits from PJ's open drumming. He doesn't fill a lot, but just keeps a solid beat going. I heard all the instruments when I expected to, and you didn't miss any microphones. My only thought on the mix at all was during the first song of the second service. When any song splits the men and women up, I think the women should be as loud, if not louder than the men. For instance, if the men sing first, the women need to be able to hear their line and sing over the guys, so the women may actually need to be a little bit louder. Lighting was very simple this weekend because we had a new set which was, in fact, no set. Overall, it was a nice change. Did you like it? Speech During Music - I want to make a change to our regular practice when someone comes up to talk during music. Until now, we have added the sermon lighting to the band lighting. However, the lights on the front line musicians often create hot spots in the sermon area which make the lighting for video less than ideal. From now on, I'd like to transition fully to only the sermon lighting whenever someone comes up to talk, whether planned or spontaneous. House Light Changes - Sometimes, we have lighting cue changes that only adjust the house lights, for instance the transition between the announcements and the sermon. We have house lights at 90% for the announcements, then drop the house lights to 65% for the sermon. If you happen to miss a cue like this, please just skip the cue rather than make the transition at a random time. The difference between the 90% and 65% house lights is much less important than keeping the focus on the sermon once it's started. The pastor cam really makes an appreciable difference in the amount of lead time we get in preparing for a ministry mic moment. The extra time gives us a crucial edge in preparation and will allow greater consistency in getting the camera on target. In short, it rocks. Thanks. A person comes to the pastors at the mic to get initial approval for their idea. The pastor considers if it is strong enough and if can be made to fit into the song flow. If they think it will work, they walk across the front row to consult with Josh or Grant. Josh or Grant will give the final approval on the content. The pastor returns to the aisle by the mic and lets the church member know whether or not they will be able to share. The pastor communicates with the worship leader that a person is ready to share. The worship leader decides exactly when they can make the musical transition to the ministry mic moment. All of this may happen in the matter of 30 seconds or over a period of five minutes. The key for us is that at step 1, we should immediately get cam4 set up for the ministry mic. If at step 2 or step 5, the person leaves the lineup, we can return to normal operation. Cam4 ops, please don't forget to write down your preset focal length and iris levels for the ministry mic location, so that you can lock in the shot without lights or a subject. On a different note, I've noticed that we are slowly shifting to an all-the-same shot setup. All three cameras have essentially the same framing, from just below the pulpit up. We need to change it up a little. Cam1 should stay close in, but cam2 should be wider, preferably waist up. This makes the cut from cam1 to cam2 less awkward and sets up for a nice transition from cam2 to cam4. All lyrics should be centered. Not only should they be center justified, they should be centered on the screen. If you adjust one side margin, please make sure to do the same on the opposite side, so that the text remains in the center and doesn't shift one way or the other. Also, please know that your operating position is severely off-center. If you are unsure if the image is rendering center on the projector, please walk to the center aisle and look from there. Don't try to make it look exactly center from the computer station. All sermon notes should be left justified. For sermon points, all complete sentences should end in a period. Sentence fragments should have no punctuation at the end. This is something we'll need to watch because the pastors are not paying attention to these deatils when they type their manuscript. Please make sure that either Ben, Bram, Josh, or I look at the sermon notes before the service starts. We try to get there, but sometimes other things get our attention. It is very important that we look over them before the first service starts, and you can help by reminding us. I'm looking forward to hearing your thoughts on Sunday, also. Comment away! I want to blog more. That's one of the things I'm writing in a blog post about my goals for the new year. You would already know if I had actually finished the post. So, it's not a great start, but maybe this randomness makes up for it. Tech ministry is like kindergarten. Neatness counts. I spent much of today revising our sermon media systems, recreating the order forms, and making an organizational bin for the completed CDs and DVDs that are ready for pickup. Similarly, my next video assignment is this: How to Tape Down a Cable. Somehow, I've failed to adequately train my team in this critical art, and I waste many minutes battling to remove stuck-to-self gaff tape. Windows are wonderful. I'm exploring changing offices to one that is further from the rest of the staff (downside) but has windows (upside). So far, my outlook and my productivity have been way up. We'll see how the new spot works out for tomorrow's church service. Ah....natural light.